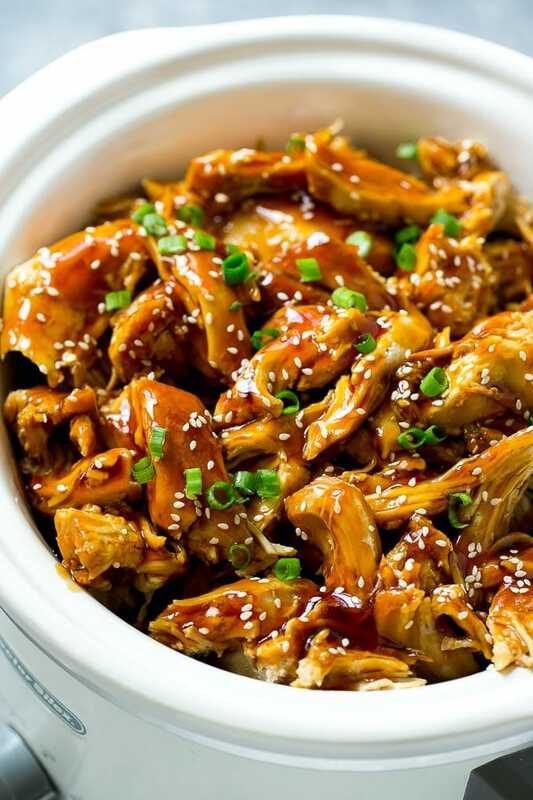 Slow cooker teriyaki chicken is chicken breasts cooked with garlic, ginger, soy sauce and honey, then shredded and drizzled with sauce. Serve over rice for an easy yet satisfying crock pot dinner! Being able to throw a meal into my crock pot for dinner is something I have always been extremely thankful for. 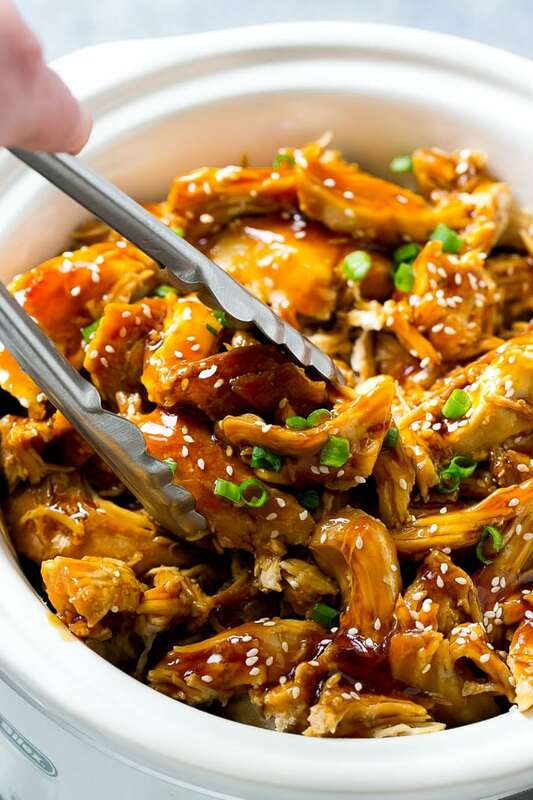 This slow cooker teriyaki chicken is one of my go-to dinner ideas because it’s quick and the entire family loves it. Plus, because it utilizes the slow cooker I can throw dinner on earlier in the day and forget about it. 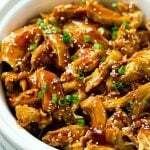 HOW DO YOU MAKE SLOW COOKER CHICKEN TERIYAKI? Thankfully, this teriyaki chicken is as easy as tossing all your ingredients in a crock pot and leaving it to cook. 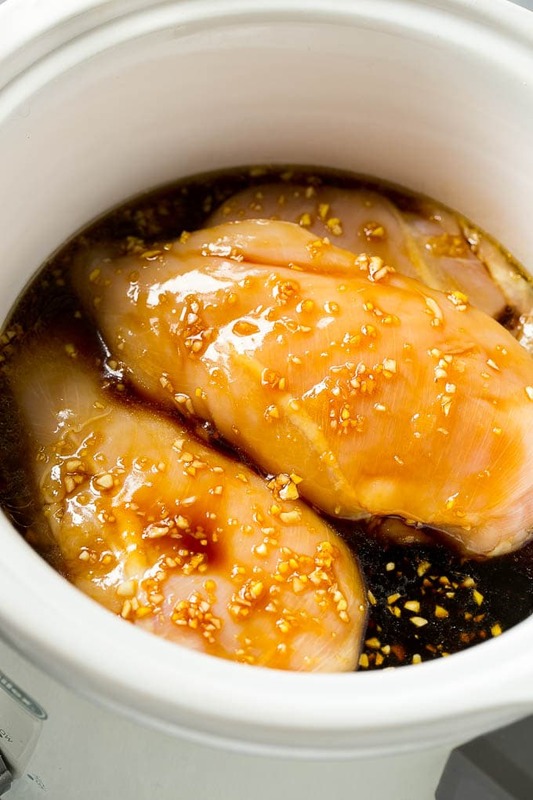 Chicken breasts are cooked with garlic, ginger, soy sauce, and honey, then shredded before being drizzled with sauce. 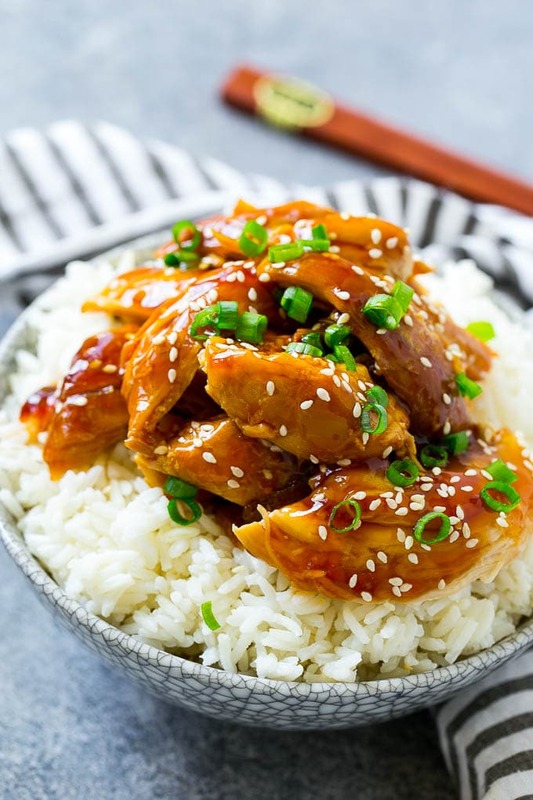 Serve your crock pot teriyaki chicken over rice and you’ve got a satisfying dinner! Depending on your preferences, chicken thighs or breasts can be used to make teriyaki chicken. One of the best parts about this recipe is that it can easily be doubled to feed a crowd if need be. Not to mention, it only takes about 5 minutes of prep time which makes for a quick meal all the way around. 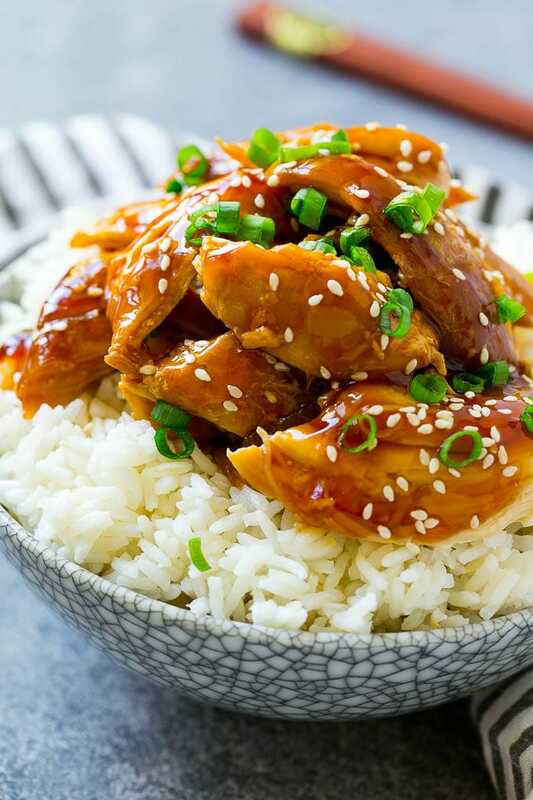 You can eat crock pot teriyaki chicken as is, but it’s best when served over steamed rice. If you love this slow cooker chicken teriyaki, you’ll also love this chicken teriyaki stir fry which has similar flavors but is ready in 30 minutes. Chicken teriyaki is made with mostly healthy ingredients. That being said, soy sauce is salty, and too much sodium is not good for you. Be sure to use a low sodium soy sauce in this recipe! CAN YOU COOK RICE IN THE CROCK POT? Yes, you can cook most things in the crock pot. However, you would have to cook it separate from the teriyaki chicken. Cooking rice in a crock pot makes it take much longer than just making it on the stove, however, it can be done if desired. CAN VEGETABLES BE ADDED TO SLOW COOKER TERIYAKI CHICKEN? Vegetables can definitely be added to this recipe. Most popular stir fry vegetables such as broccoli, asparagus, snap peas, bell peppers, etc. can be added to this dish to personalize it. However, be aware, those most vegetables will need to be added later in the cooking process or they may get soggy. If you’re dreading school because weeknight dinners are so stressful, I’m with you. However, I have started preparing for busy nights by pulling out as many slow cooker recipes as possible. 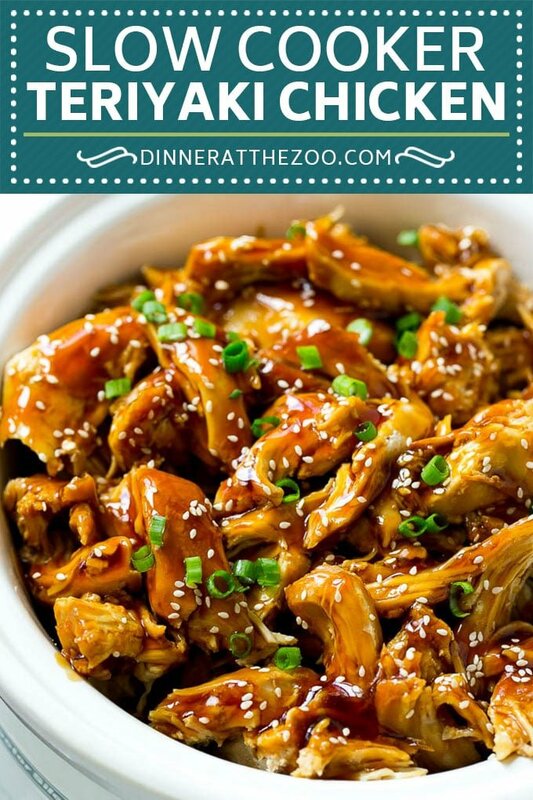 I’m definitely adding this slow cooker teriyaki chicken to the weeknight dinner rotation! In a small bowl, whisk together the garlic, ginger, honey, brown sugar, soy sauce sesame oil and rice vinegar. Pour the teriyaki sauce from the slow cooker through a strainer into a saucepan. Place the saucepan on the stove over medium high heat and bring to a simmer. In a small bowl, mix the cornstarch with the water until dissolved. Pour the cornstarch into the pan and bring a boil. Cook for 1-2 minutes or until sauce has just thickened. Pour the sauce over the shredded chicken and toss to coat the chicken. Sprinkle with sesame seeds and green onions, then serve. I cooked the chicken for 5 hours. It was too tender but delicious. I used boneless chicken breast. Love it. Made this last night for dinner, it was a huge success. I just did not use corn starch to thicken the sauce, cause thought it was perfect as is. Wasn’t sure my last comment went through and I did want to say how tasty this was. I did use drumsticks as it was the only chicken I had on hand, and substituted apple cider vinegar as I rarely have rice wine vinegar in the pantry. The outcome was extremely tender, savory, just basically delicious. 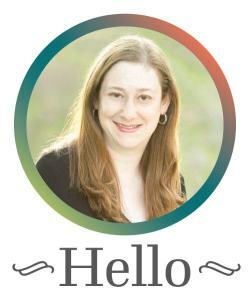 I will most definitely be sharing this crock pot recipe, and am glad to add it to my book. So happy to hear you enjoyed it, I love the idea of using drumsticks. Thanks for reporting back! My pleasure. And as an added bonus, at lunch I just discovered that the leftovers are every bit as scrumptious. This is one dish that could serve as a staple as well as serving to company. It’s that good.